KATHMANDU, July 15: Former Health Minister and Nepali Congress leader Gagan Thapa has questioned Prime Minister KP Oli’s statement to make the country a medical hub by establishing more medical colleges in the Kathmandu Valley and outside. Addressing a mass gathering at New Baneshwor on Saturday, held in the support of Dr Govinda KC who has been staging his 15th fast-unto-death in Jumla for medical sector reforms, Thapa said that an additional medical college in the Kathmandu valley will not help improve the quality of health services in the country. “Bangladesh is known as a medical hub. It has lots of medical colleges. But why our Prime Minister visits Thailand for his treatment?” asked Thapa. He further claimed Oli’s plan to welcome foreign students to the medical college in the country will not work if the quality of medical education is poor. Thapa further insisted that additional medical colleges should not be allowed in the Kathmandu Valley as recommended by the Kedar Bhakta Mathema-led high-level taskforce. The recommendations of the taskforce are based on in-depth research, knowledge, analysis and opinions of experts in the field, he added. 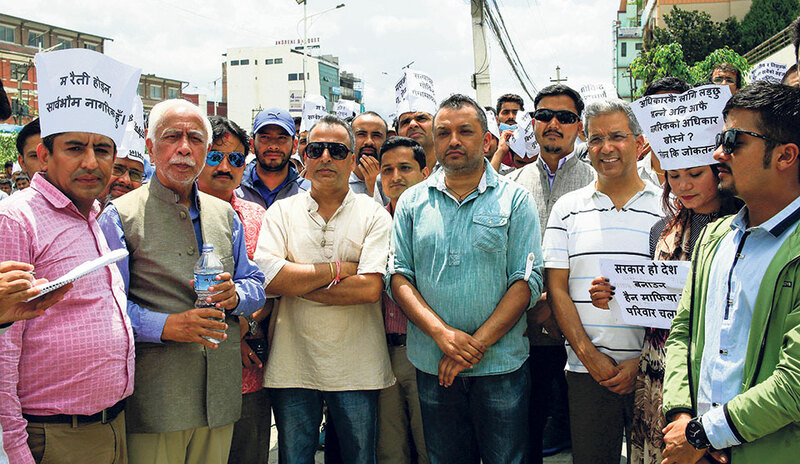 “Barring additional medical colleges in Kathmandu is not the demand of Dr KC; he is just demanding the implementation of the recommendations made by the Mathema taskforce,” said Thapa. Refuting allegations leveled against Dr KC that he is forcing youths aspiring to study medicine to go abroad due to the lack of medical colleges in the country,Thapa claimed the trend has massively declined after Dr KC’s awareness. “Students are not going abroad for medical education because of the lack of colleges in Nepal. Some medical colleges in Nepal still do not have enough students,” he said. Speaking at the program, former Tribhuvan University vice-chancellor Kedar Bhakta Mathema, said that the new Medical Education Bill registered in parliament by the government has ‘seized’ the basic health rights of the people. He also accused the government of entitling benefits to selected persons. Addressing the mass gathering, Senior Advocate Surendra Bhandari accused Prime Minister Oli of trying to dictate parliament with the backing of a two-thirds majority. A march taken out from Maitighar Mandala to extend solidarity with Dr KC’s protest and pile pressure on the government to address his demands converted into a mass gathering at New Baneshwor. Doctors, nurses, students, other medical professionals including various 13 professional organizations participated in the march to support Dr KC.